Does Teacher Certification Make a Difference? Not according to this latest study from Brookings. Or it might mean that teacher quality is less important than other variables when explaining student outcomes. Income of the student, income of the community, parental involvement, parent education levels, overall funding of the school, and attitude of administration might be more important. It also shows that the enormous amount of energy that teachers spend getting certified is a waste of time. Some people might have been just fine teachers, before they spent two years in education school. One should push for alternative certification not because it's good for students (it seems to make no difference), but because it's good for teachers. Disclaimer. I haven't looked very closely at the data myself. It may be that the alternative certified teachers in this study are a very small group of unusual people — highly educated and motivated individuals like the Teach for America people. < Previous No Kids? Fine. Then She Can Do the Job. It could also mean that teaching certification is not a good predictor of teaching quality. As a high school teacher, I 100% agree that certification means squat. The teaching internship is helpful. But mainly, I think getting someone solid in their subject area, setting them up with a good mentor/experienced teacher to help design the curriculum/lessons and emphasize good classroom management. I suspect the elementary level is different. I have met amazing teachers. I’ve also been reminded regularly of something I heard Detective McNulty say in The Wire: Season 1. What does a guy have to do around here to get fired? Latest study? Your link goes to a report that has nothing to do with certification, and as best I can tell that figure comes from page 8 of this 2006 Brookings paper. They did attempt to control for some of this in a naive way (I’ll hold back a long rant about why social scientists presume that a linear regression is the solution to almost every problem). And, I could add my rant against assuming that there’s something special about the outliers in what looks like a normal distribution. If we were looking at a distribution of height, we are indeed be able to conclude that the outliers of the distribution are taller than average. But, we certainly can’t look at the outliers in the distribution “the change in percentile rank of the average student” and assume that the the outliers are better teachers (or worse). I think my comment re-states siobhan’s — in that the main reason is that one cannot assume that all other sources of variability have been magically filtered out (by linear regression, or any other tool). And, in this case it’s even impossible to do the perfect experiment: i.e. have two different teachers teach the identical class the same material and see which one does better. Maybe if we had two different classes made up of identical twins :-). Ha. I’m laughing at you science types. I don’t want to get into the loser position of defending quantitative methods in social science. It is a clearly flawed proposition, especially when compared to studying test tubes and agar dishes. Social science always involves some guess work, since there are just way too many variables to control for and people are too big to fit into an agar dish. Still, very limited (and boring) questions can be got at through large N quantitative studies. Bigger questions can answered through multiple studies with different methodologies looking at the same question. This Brookings study should be approached as initial findings. Then twenty different researchers should look at the same thing. I was thinking of various possibilities of how to do those studies and all of them involved turning the students into guinea pigs. Tricky business. How about having a cohort of perspective teachers teach five classes for one year in schools throughout a city. Test the kids. Then have the teachers get their masters in education and get all the proper paperwork and then have the teachers teach in the same schools for a year. Test the kids. There would different kids involved, but if the teachers taught multiple classes in the same schools, it might control for some variation in student quality. Social science always involves some guess work, since there are just way too many variables to control for and people are too big to fit into an agar dish. Still, very limited (and boring) questions can be got at through large N quantitative studies. I don't have a problem with social science — I do social science, it’s just not what’s on my degree. But there are a variety of ways in which this could have trivially been made into a better study. Social science does a poor job of positioning itself for respect and funding when it trumpets OLS regressions in glossy color publications and then defends it with “Well, we have to start somewhere.” I am not joking when I say that I’d expect my undergrads to be able to do a better job with the same data as a one-week homework assignment. The same techniques that work in scientific analysis work in social science, too. I think it would be interesting to take a full staff of “highly effective” teachers (based on “student achievement”) and put them all into one “high-need” city school. See what happens. That’s one of the few experiments I can think of that wouldn’t be unethical in terms of using kids as guinea pigs. Even the study’s proposal to allow people from other careers (and I’m a career changer, from editing books to teaching English) to come in untrained and “demonstrate their effectiveness” seems unethical to me. Not that certification proves that a teacher will be effective, but it does prove that the system has made a good faith effort to ascertain that the teacher is prepared. What if an untrained teacher demonstrates failure instead of success? How does the school justify that to kids and parents? How does the administration explain that the person had no training in the profession but they hoped it would work out anyway? I agree that administration needs to pay close attention to how teachers are developing throughout their careers. Dropping a teacher, certified or not, into a classroom and hoping for the best is a bad idea for everyone. But quality supervision requires good administrators, which is not a given. Hey can you get them to? The data set must be publicly available, no? That “study” could get some press of it’s own. Isn’t Suze’s “experiment” being tried? The problem with it, as an experiment is that it isn’t “blind.” One might see results in that case, but my first guess would be to attribute the success of those “effective” teachers to their desire to prove that they are indeed effective in this new environment (which they were presumably incented into joining). It seems to me to be the “stand and deliver” model, in which extraordinary teachers put extraordinary effort into helping. No doubt in my mind that they can do it. But, I think the resulting success depends on the extraordinary effort (which in many cases involves the teachers taking on the vocation to “live like a nun in a cloistered abbey” in order to give everything they have into saving the group of children entrusted to them. Merely being an extraordinary teacher probably isn’t enough. (Incidentally, I also the success, such as it is of the KISS model largely to this effort and not to the specific script teaching used, though that belief is certainly an unproven presumption). And, as I mentioned in the other thread, methods of saving our schools that require our teachers to put the children in their class ahead of everything else in their lives are simply not fair, since it puts the burden solely on their shoulders. Teachers have lives, too, and ignoring that unfortunate fact in our staffing won’t save our schools. One interesting graph in the Brookings’ report is the changing age distribution of teachers. I’ve always thought that one of the main reason that we think teachers used to be “better” in the “olden” days is that schools were staffed by single women with no outside responsibilities, the job you did until you got married, or got pregnant. Of course, that staffing model also benefited from the lack of jobs for women in other fields. I don’t know of the type of school experiment I envision being done, but they may be out there. I’d love to see info if anyone knows. I’d propose putting the “highly effective” teachers into an existing poor-performing school, with all other factors and resources remaining the same (including the student and parent population). You are probably right, bj, that the results would be somewhat skewed by what I think of as heroics. And I agree that heroic measures are not ultimately useful to the discussion of how to improve schools (though great for the kids who benefit) because they’re not reasonable, replicable, or sustainable, and teachers shouldn’t be expected to give up everything for their profession. There’s an interesting experiment about to start at a school, opening in Fall 2009 here in Manhattan (unless funding problems intrude), that is intended to look at the question of whether high pay draws better, more effective teachers (teachers will make $120K, or thereabouts). BUT… students APPLY to the school (they will take students from under-resourced areas). That fact, I think, negates the pay experiment. Applying to a school says that you and/or your parents care, at least a little bit, about school. And that can make a tremendous difference. Fun thread. Just came back from dinner w/hubby where we talking about the comments. I think that the main issue with certification isn’t that it makes a difference or not in student outcomes. It is that the process is so cumbersome that potentially excellent teachers are turned away from the profession. As I think Wendy said in a previous thread, she would have to go back to school to get certified to teach even though she has a PhD and tons of classroom experience. And I know that Suze has said several times that some of her education classes were of not high quality. I think that the certification process could be stream-lined. 1 year of classes in a subject area and 1 year of full-time student teaching w/pay in exchange for a promise to teach in the school district for another year. I would like to look at just that group of uncertified teachers. Do they come from more competitive schools with higher GPAs than the certified teachers? Do they stick with teaching for longer than two years? If certification requirements were stream lined, would that attract higher achieving individuals to education? In the UK the standard certification is just one year, most of it spent in the classroom; if you are admitted to the program, tuition is waived and the government provides a small stipend (enough for a 23 year old to live a spartan life in a provincial city, but not in London). It was reformed from a much more college-class-heavy program in the 1980s by the Thatcher government, partly to get prospective teachers away from the influence of purportedly left-wing education professors. No-one has really studied whether the “new” certification is better than the old. But just about everyone thinks it is (me included). In the US, the certification process is even state-specific, isn’t it? That’s always bugged me, unless you’re actually teaching state history, it seems that certification should cross state lines. The only reason not to is to produce barriers to movement in/out of the labor force. True for doctors, too. Speaking of certification and restriction of competition, I was looking up the requirements to be a public school guidance counselor in the state of Texas (as an option for something for me to do when I grow up–I think it’s a really important job, and I don’t think it’s taken nearly seriously enough). Anyway, as far as I could tell from looking at the internet, the requirements included teaching certification, and maybe even a couple years of classroom experience. Speaking of portability, I believe there are also some issues for teachers with regard to portability of seniority and benefits. Harry b? Yes. If you move between States (in public schools) you typically leave one retirement system for another, so if you have a defined benefit plan then your final retirement from your new state is based on fewer years, whereas your years from the previous state are multiplied by a lower salary. So you are much better off in retirement terms not moving between states (or moving either very early or very late in your career). The typical salary schedule does count previous years of experience toward your salary (so if you worked in one district for ten years and then moved to another the new district will pay you as if you’d been working there 11 years. But seniority starts anew (ie, in the new district you are the first to be fired/moved, and the last in line for desirable assignments). This is so even if you move to the neighbouring district in the same state. And years of experience doing anything others than teaching under a union contract do not count at all for salary purposes. A friend of mine was a research chemist (with oodles or publications and management experience). She decided to retire early, spent 2 years getting licensed, and then became a public school teacher at the starting salary. That takes a level of commitment to the public good that we should not demand of prospective teachers. (Prospective saints, sure, but the public doesn’t pay their salaries). It is a good idea to have some basic licensing requirements. Most states have excessive requirements, and I don’t think it even has the upside for teachers of keeping their salaries artificially high (as it does for doctors and lawyers). 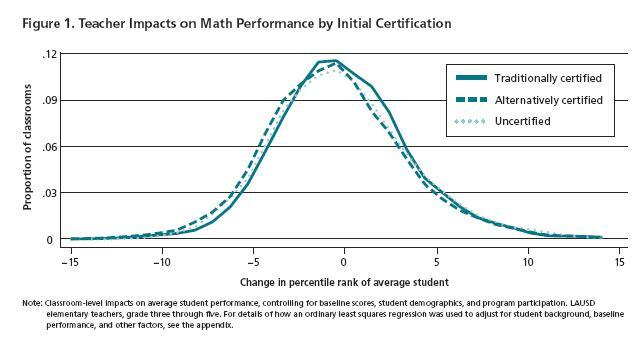 The graph does suggest that the process of meeting the certification requirements does nothing or almost nothing to either make the newbies more effective as teachers or identify those who will be effective. Costly waste of time, and a barrier to entry. On the other hand, just letting any shmoe who has gotten a BA from Chico State Normal School teach may not be the best way to go, either. TFA seems like an apprenticeship system, basically – may be a good idea. The schools still haven’t recovered from the loss of so many of the smart and energetic women to accounting, law, chemistry, podiatry – the careers they were denied for so many years. You must teach in an awfully special place if you have undergrads who even know what an OLS regression is, let alone can do something econometrically superior within a week. Anyway, this isn’t a new finding . . . Dan Goldhaber and his colleagues regularly find the same thing using nationally representative data. My sister is a teacher – and a great one (elementary school level). She was a terrible student (ran a SAT cheating ring – bad letter in her permanent file and was caught plagarizing in college). But she finished her master’s at 21. Her first job was as a preschool director for the local Y – she brought up raising to a totally new level – something she has done in each school she has taught in. She could sell anyone a snowball in hell – and she is able to delegate and organize efficiently. She is the one that they give all the borderline spectrum kids to because she (being as OCD and ritualized as they are) gets to. She is great at communicating with parent. They have begged her to become a principle (they need to refer to SAT scandal so I’m glad she never went off to Columbia U for that). She gets kids. Me, 5 years of grad school and ABD when I got my first class. HATED IT. I was not a good teacher. Even though I am sure I could have been certified I would not have liked it. My husband, I think, would have been an excellent teacher. He taught as an undergrad at Binghamton and University of Michigan wanted him to teach poli sci. He is clear and concise with our own kids figuring out how to get around math problems when they don’t get the concept or restructuring their writing so that it is as clear and concise as any opinion he has written. He is the one teaching all the new associates their continuing legal credits or patiently teaching our senior parents the computer. Some people are born with it- others are not. There is an easy test to find out who has it or not – give them a class of special ed kids for a week – and see how they do. My son goes to a school especially designed for ADHD and Asperger’s – at times it can be a circus. Last year, the teacher was amazing – she was able to judge who could do what even when she had to take into account all their particular personal nuttiness. This year’s teacher’s (also special ed certified) as gone to the lowest denominator. Two people, same certification, different outcomes.